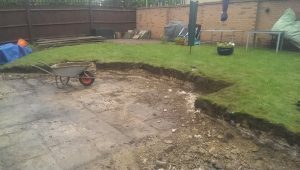 Client wanted to build a patio at the rear of their property with a retaining wall. 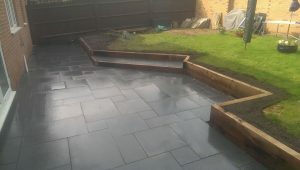 We have just completed the Dark Granite paving patio with hardwood sleeper retaining wall. As you can see the results are pretty impressive. We understand that your property is a big investment and we want our customers to know that we are there for them to help them accomplish the dreams that they may have for their property. Working closely with the customer we delivered a stunning solution and the client was very pleased with the outcome.